I bought my car used and have had it over 3 years. I put on about 50,000 miles before I had to make any repairs. Nothing major has gone wrong it's been a very dependable car for my family. We drove it to move to Florida from RI 1,400 miles with no problems. I have moved large items with it like a couch and a treadmill. The back seats fold down to allow tons of room to fix things in which has come in handy many times. When it comes time for a newer car I'll be looking at another Hyundai since I've had good luck with this one. I was rear-ended in it and no one was seriously hurt and we got hit pretty hard the other car was half way under us. I keep up with the oil changes and tires and in the time I've had it I finally had to replace the battery and was shocked to find out it was the original factory batter from 2005 still there. The car seems to be made with quality parts as they have lasted and now as I'm making some replacements I'm finding out they are all original parts so this means that the car has run smooth without repairs since 2005 and now only due to its age is now starting to need some things fixed but I must say I have never been stranded the problems were always gradual and obvious but I was always able to still drive it until it got repaired. The Hyundai Santa Fe: worth a second look. I bought my car used in 2007, and it has been completely reliable the entire time. I have had to replace the battery twice and the tires twice in the 11 years I have had it. Since it is an older model, I have to use a Bluetooth for GPS, so I am ready to get a new car so I can have factory GPS. Mine has a sunroof, and I was told by friends that it would probably leak after a while because the rubber molding seal would dry up and deteriorate. This has not been the case at all. I have had no problems with the sunroof. The power locks all continue to work perfectly, so does the air conditioner, heater, radio, CD player, cruise control, etc.. I even have a lighted drivers side mirror that has never had to be fixed or the bulb to be replaced. I looked into other makes and models, but through talking with friends and family, I discovered most luxury models are not only expensive to purchase, but also expensive to fix every time you have to take it to the shop. Since I have had such few issues with my Santa Fe, I haven't had to worry about how much the parts cost to replace or repair. I have been very happy with this car, and will look into purchasing another Santa Fe when I go to purchase a new one. It was a great choice of purchase. There is no problem with my vehicle, it runs great, good gas mileage. Only normal maintenance is required as necessary such as changing motor oil, changing the spark plugs and wires and the battery. And of course always check your fluids such as, brake fluid, motor oil, power steering and transmission oil. Having good tires is always a plus, makes the vehicle drive like bra and new! Its has been very reliable without leaving me stranded, thank god!! I am comfortable driving my vehicle and no one has complained about being uncomfortable while being a passenger. Features are good but with a all the updated choices now, I can use the updates. 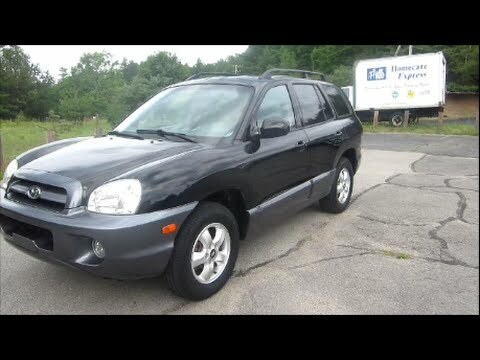 Used High mileage Hyundai Santa fe review, what to expect. ON CERTAIN VEHICLES EQUIPPED WITH AN ADVANCED AIR BAG FEATURE, THE OCCUPANT CLASSIFICATION SYSTEM (OCS) INSTALLED IN THE RIGHT FRONT SEAT OF THE VEHICLE MAY MISCLASSIFY A CHILD RESTRAINT SEAT (CRS) AS AN ADULT. THIS MAY OCCUR IF THE CRS IS INSTALLED AFTER AN ADULT HAS BEEN SEATED IN THE RIGHT FRONT SEAT. IF THERE HAS NOT BEEN A 'KEY ON' ' KEY OFF' CYCLE WITH THE RIGHT FRONT PASSENGER SEAT EMPTY PRIOR TO INSTALLATION OF THE CRS. THE POSSIBILITY OF MISCLASSIFICATION OF A CRS AS AN ADULT MAY ALLOW THE RIGHT FRONT AIRBAG OR SIDE IMPACT AIRBAG TO DEPLOY IN A CRASH AND COULD RESULT IN INJURY TO THE RIGHT FRONT OCCUPANT. DEALERS WILL REPROGRAM THE VEHICLE'S OCS ELECTRONIC CONTROL UNIT (ECU) TO REMOVE THE FEATURE THAT MAY CAUSE THE CRS TO BE RECOGNIZED AS AN ADULT. THE RECALL IS EXPECTED TO BEGIN DURING DECEMBER 2005. OWNERS SHOULD CONTACT HYUNDAI AT 1-800-633-5151. ON CERTAIN SPORT UTILITY VEHICLES EQUIPPED WITH AN OCCUPANT CLASSIFICATION SYSTEM (OCS) THE RIGHT FRONT SEAT OF THE VEHICLE MAY MISCLASSIFY CERTAIN SMALL CHILDREN SEATED ON THE FRONT EDGE OF THE SEAT AS AN ADULT. THE POSSIBILITY OF MISCLASSIFICATION OF CERTAIN SMALL CHILDREN AS AN ADULT MAY ALLOW THE RIGHT FRONT AIRBAG TO DEPLOY IN A FRONTAL COLLISION CRASH OR THE SIDE IMPACT AIRBAG TO DEPLOY IN A SIDE COLLISION CRASH; SEVERE INJURY OR DEATH COULD OCCUR. DEALERS WILL ENSURE THAT THE VEHICLE'S OCS WILL PROPERLY CLASSIFY CERTAIN SMALL CHILDREN WHEN SEATED ON THE FRONT EDGE OF THE SEAT AND WILL DISABLE THE RIGHT FRONT AIRBAGS. DEALERS WILL REPROGRAM THE VEHICLE'S OCS ELECTRONIC CONTROL UNIT TO PROVIDE AN INCREASED MARGIN FOR RECOGNITION OF CERTAIN SMALL CHILDREN. THE RECALL IS EXPECTED TO BEGIN ON DECEMBER 6, 2005. OWNERS SHOULD CONTACT HYUNDAI OF PUERTO RICO AT 1-800-981-0188.